What is a flex fuel pump? 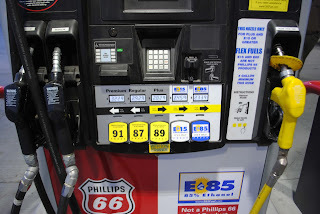 A flex fuel pump offers several American Ethanol blends. While higher blends of American Ethanol (E20 and above) are approved for use in flex fuel vehicles only, flex fuel pumps also offer E10, E15 and may offer ordinary unleaded gasoline and “premium” gasoline. “Blender pump” is another term used to describe this type of dispenser. Where can you find higher blends of American Ethanol? “NO ETHANOL” - Some retailers offer fuel containing no ethanol at all—and, as result, it is typically priced higher than E10. “Ethanol-free” fuel is one more choice offered by retailers. But if you believe in the clean-air, renewable, domestically-made benefits and decades of proven performance of American Ethanol, then choosing ethanol blends makes sense. E85 - The highest American Ethanol blend available at retailers, E85 is approved for year-round use in flex fuel vehicles (FFVs). E85 is typically identified with a yellow hose and/or nozzle handle. E15 - is approved for use in all standard vehicles from September 16 through May 31. If you drive a flex fuel vehicle (FFV), you can fill up with E15 throughout the entire year. Thanks to the higher percentage of ethanol, E15 should be priced less than E10— and significantly less than fuel containing no ethanol. E15 is frequently identified with a blue hose on the dispenser. E10 - The most widely available ethanol blend and warranted by all automakers. E10 can be used in any standard vehicle as well as in motorcycles, lawnmowers, boats and other engines.